Michigan voters in November will have the final say on a ballot proposal to expand voting access in Michigan. The four-member Board of State Canvassers on Thursday unanimously voted to send the initiative, backed by a ballot committee called Promote the Vote, to the November ballot. It will join two other statewide ballot proposals on the general election ballot. State canvassers are set to meet again Friday to finalize the initiative’s ballot language. The Promote the Vote proposal is an amendment to the state constitution that proponents say is designed to make access to voting easier in Michigan. Constitutional amendments, unlike citizen-initiated legislation, automatically appear on the ballot once they are certified without first going before the Legislature for possible adoption. If passed by voters, the proposal would constitutionally enshrine straight-ticket voting and post-election audits; automatically register Michiganders to vote when they visit a Secretary of State office unless they opt out; allow more time for residents to register to vote before an election, including on Election Day; and allow a state resident to vote by absentee ballot without needing to first declare a reason. Michigan has allowed voters to check one box to vote for a single party on the ballot in the past, though the Republican-led state Legislature in 2015 voted to ban so-called straight-ticket voting. A federal judge recently ruled that the ban discriminated against black voters, who tend to vote for Democratic candidates, and ordered the practice reinstated. A federal appeals court upheld the ban, however, in a ruling Wednesday. Cook said the constitutional amendment would supersede the state law that is being challenged in federal court, though he acknowledged that an attempt to challenge the constitutionality of Promote the Vote’s straight-ticket provision could be brought later if voters adopt it. The ballot initiative is backed by the ACLU of Michigan, the League of Women Voters, the Michigan League for Public Policy and the NAACP Michigan State Conference. It also has support from Detroit Mayor Mike Duggan, Grand Rapids Mayor Rosalynn Bliss, the Detroit Regional Chamber and other individuals and groups. Opposition to the initiative has been quiet to date. No one spoke Thursday against certifying the proposal, though a ballot committee called Protect My Vote challenged a number of Promote the Vote’s signatures. Protect My Vote formed Aug. 23 and lists its treasurer as Mary Doster, the wife of Okemos election law attorney Eric Doster. Mary Doster also serves as treasurer for the campaigns of Republican-backed Supreme Court justices and the nonprofit Michigan Redistricting Resource Institute, a group linked to the Michigan Chamber of Commerce. Protect My Vote has not yet disclosed any campaign finance reports with the state, so it’s so far unknown who is funding the opposition effort. A representative for the committee could not immediately be reached for comment Thursday. Promote the Vote submitted more than 430,000 signatures in July. As a constitutional amendment, the committee needed at least 315,654 to qualify for the ballot. State elections administrators pulled two samples of signatures to review after an initial, smaller review of the validity of voters’ signatures was inconclusive. State canvassers ultimately certified the proposal after the second, larger sample determined Promote the Vote had obtained enough valid voter signatures to qualify for the ballot. The ballot committee last month filed a federal lawsuit in hopes of compelling the Board of State Canvassers to quickly certify the proposal. Cook said the group’s attorneys have not yet decided how to proceed on the lawsuit, which dealt with the state’s signature review. Promote the Vote’s voting access proposal will join two others on the Nov. 6 ballot: A legislative proposal to legalize recreational use of marijuana and a constitutional amendment to create an independent redistricting commission. Two other ballot initiatives circulated this election cycle but will not appear on the November ballot because the Legislature voted Wednesday to adopt them: raising Michigan’s minimum wage and requiring employers to offer paid sick leave. 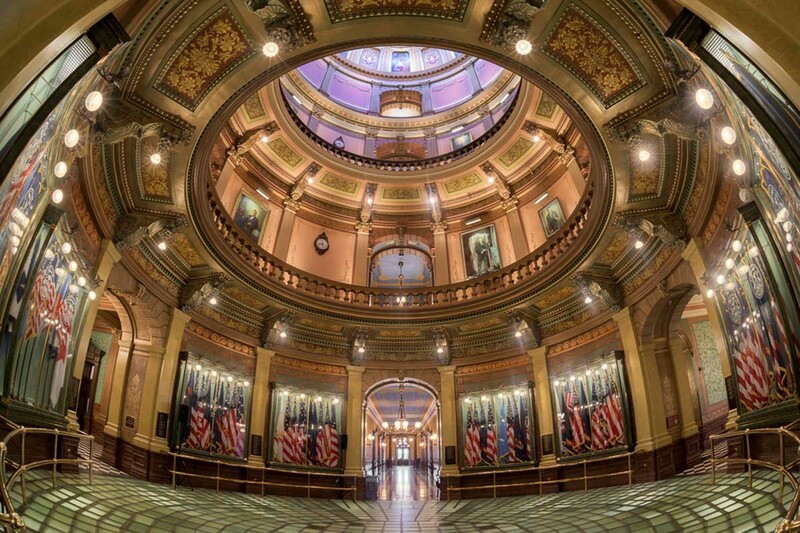 A third, repealing Michigan’s prevailing wage statute, was adopted earlier this year. I still see the democratic party backed Promote the Vote is peddling a solution in search of a problem. I have yet to see anything on this story where they trotted out someone who was adversely affected by our current voting system. I'm unaware of anyone who developed writer's cramp filling in dots on a ballot during a Michigan Election. Something like 40 states have the same system that we do, without reporting the problems the democrats behind Promote the Vote have perpetually claimed. Has The Bridge ever found such a person? I'm unaware of anyone who wanted to vote, who didn't at least take the time to determine when and how to vote. Has The Bridge found such a procrastinating person? And you're waiting for the last minute to vote? If you cannot bother to educate yourself regarding who and what is on the ballot, do you really want to ignorantly walk into a polling booth at the last minute? And why is it that the democrats behind Promote the Vote always claim that obtaining an AV is a problem? I, and several of my friends, have voted AV in the past and DID NOT have any problems obtaining a ballot whatsoever. If you educate yourself on when and how to vote, this IS NOT a problem. I'm still failing to see the necessity of this since the democrats behind this proposal have not produced any affected voters. Counterpoint: Is there any real issue with making voting easier? Why is it that republican are against giving the people any voice in OUR government????? Bones: Exactly how much EASIER are you proposing? Do you need someone to wake you up on Election Day to clean you, dress you, feed you and physically take you by the hand to the nearest polling place? The process for voting right now is ridiculously easy as it is to most intelligent and responsible adults. Don: Spoiler Alert! You'll have the opportunity to do just that on November 6th. Here's another spoiler alert: the full list of candidates for the various state and federal offices along with ballot proposals and their status can be found below. If you cannot (or will not) take the time to educate yourself regarding who and what is on the ballot and when to vote, the only person responsible for not being heard is you. The big problem is that the drmocrates in MI allow Ruth Johnson to destroy ballots with on checking them first!!! Let's get straight to the real reason straight ticket voting was changed. The democrats have a well setup process that depends on straight ticket voting. They have community organized transportation where they collect voters to vote and then return them to their homes. This works very well for them when they do not have to educate the voters. All that they have to tell the voters is to mark which party they want to vote for. Republicans do not have a populace to exploit of their own or counter to this except for banning it. The Democrats have an organized system to help people vote. The rest is a racist dog whistle. Michigan voting process is already quite simple. I see no reason to change anything. I also cannot support Election Day registration. What is the percentage of people who've claimed our current process has kept them from voting? Just curious. If its only a few does that mean it shouldn't be changed?